For some, September in Europe might have resembled the Cold War. At least by the number of large-scale military exercises. It was kicked off on September 11-29 by Aurora 17, a joint exercise by Sweden and Finland together with several NATO members. With 20 000 troops, it was the largest drill in Sweden for 23 years and marks an important signal about a strategic change in Sweden’s military stance. Second NATO exercise, Dragon-17, started in Poland on September 20. It involved some 17 000 troops and 3 500 units of equipment. Poland and 9 NATO member countries participated, along with non-NATO Georgia and Ukraine. The exercise was joined for the first time by Poland’s Territorial Defence Forces, consisting of civilian volunteers who support regular troops. Meanwhile in Belarus, and some parts of Russia, the two countries finished a military exercise Zapad 2017, which took place on September 14-20. Much trumpeted number of up to 100,000 troops participating in this exercise has proven to be overblown, although official numbers are still unconfirmed. This allowed Kremlin to claim that the West overreacted and fell victim to scaremongering as well as to prove Russia’s military is “back and strong“. The scenario was designed to test defensive capabilities against a fictional country “Veshnoriya”. While originally the exercise was portrayed as a “defensive tactical and counter-terrorist exercise” the Russian rhetoric changed during the exercise and the aggressor became a conventional enemy. The drills, while overwhelming military success for Russia, did not do without some mishaps. A video (below) shows a Russian helicopter accidentally firing a rocket into a parking lot. According to reports, two journalists were seriously injured, and nearby cars were damaged by shrapnel. Azerbaijan released pictures and videos from its live-fire military exercise on September 21. 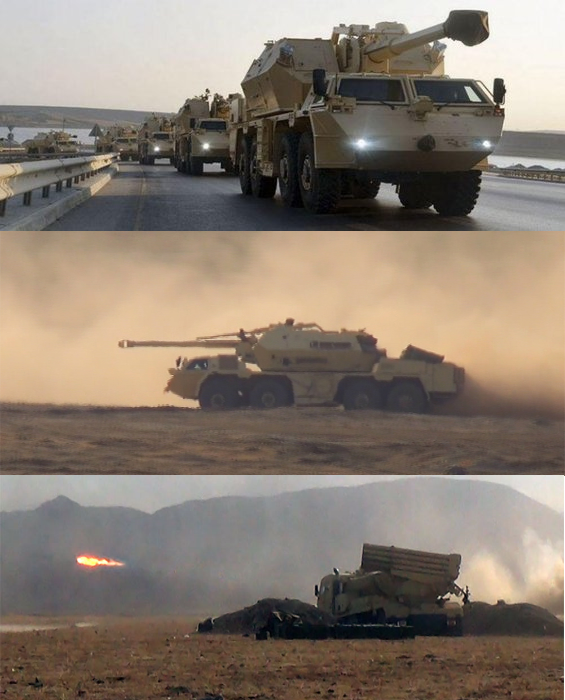 What caught international attention were the DANA-M1 self-propelled gun-howitzers and RM-70 Vampir Multiple Launch Rocket Systems (MLRS) both used in the exercise. The heavy artillery weapons are Czech-made and modernised by the Czech company Excalibur Army. But already in 1999, the Czech Republic joined an alliance of the US and other key NATO members which prohibits the sale of any lethal weapons to Azerbaijan and Armenia because of the Nagorno Karabakh conflict. Czech Ministry of Defence said, that they did not issue authorization for exporting the weapons and that they do not know how did the artillery make its way to Azerbaijan. The photos and videos show rows of DANA-M1 howitzers and several RM-70 MLRS’s. Azerbaijan requested the sale of the weapons earlier in 2016 and 2017 but they were turned down. The Czech side notified the EU about that. The Czech government, according to newspaper Hospodářské noviny which broke the story, employed the secret services to investigate the case. The weapons might have got to Azerbaijan on the black market. Allegations arose, that the weaponry might have made its way to Azerbaijan through Israel. The 72nd regular session of the UN General Assembly concluded on September 25 in New York. This year’s theme of the General Debate was “Focusing on People: Striving for Peace and a Decent Life for All on a Sustainable Planet.” Miroslav Lajčák, the Minister of Foreign Affairs of Slovakia, was elected President of the 72nd General Assembly. His priorities during his tenure include making a difference in the lives of ordinary people; prevention and mediation for sustaining peace; migration; sustainable development, climate, human rights and equality. The responses to Trump’s speech were not long in coming. North Korean Foreign Minister Ri Yong-ho asserted that president Trump’s tweet, coming after his UNGA speech, effectively amounted to a declaration of war. The North Korean leader himself called Trump a “mentally deranged U.S. dotard”. Iran’s President Hassan Rouhani warned that by unilaterally withdrawing from the Iran Nuclear Deal the U.S. would “only destroy its own credibility“. French President Macron and EU foreign policy chief Federica Mogherini, among others, also rejected the idea of scraping the nuclear agreement with Iran. Venezuelan Foreign Minister Jorge Arreaza accused the American President of acting like “the world emperor”. Amid the insults, important topics remained in the background. Impacts of climate change on Pacific island nations, a call for a comprehensive response to terrorism from Tunisia and a request from Algeria to reform the UN to better deal with the world’s numerous crises got little attention.